Segregation protest at an ice cream parlor located at Roxboro and Dowd Streets in Durham, N.C., June 23, 1957, led to court case testing dual racial facilities. The 1960 Greensboro sit-ins sparked a national movement but were not the first such action. Individual and group protest actions prior to 1960, generally isolated and often without wider impact, took place across the state and region. A protest in 1957 in Durham had wider consequence, as it led to a court case testing the legality of segregated facilities. 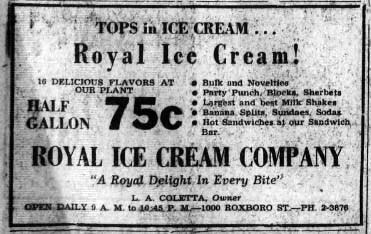 The Royal Ice Cream Company had a doorway on the Dowd Street side with a “White Only” sign and, on Roxboro Street, a sign marked “Colored Only.” A partition separated the two sections inside the building. On June 23, 1957, Rev. Douglas Moore, pastor of Asbury Temple Methodist Church, and six others assembled at the church to plan the protest. The young African Americans moved over to Royal Ice Cream and took up booths. When they refused to budge, the manager called the police who charged them with trespassing. Newspaper coverage in the Durham-Raleigh area was mixed. The Durham papers printed the story on the front-page the next day but it was buried inside the Raleigh News and Observer; The Carolinian, an African American newspaper, placed it on the front page. On June 24 the protestors were found guilty of trespassing and each fined $10 plus court costs. On appeal the case went to Superior Court and a jury trial. An all-white jury rendered a guilty verdict of trespass on each defendant. The case was appealed to the North Carolina Supreme Court that upheld the law regarding segregated facilities. On July 15, 1958, the seven protesters paid fines totaling $433.25. Attorneys appealed the decision to the U.S. Supreme Court but the High Court refused to hear the case. The boycott and pickett protest campaign against Royal Ice Cream in Durham continued into the early 1960s. In 1962, as the Durham School Board began a plan for school desegregation, African American School Board member E. Eric Moore also protested a city contract that purchased ice cream for schools from the Royal Ice Cream Company. Images of the Royal Ice Cream building and protests, from OpenDurham. http://www.opendurham.org/buildings/royal-ice-cream-charlie-dunhams-unio... (accessed April 12, 2016). 8 April 2016 | Daniels, Dennis F.